Over the past 3 weeks my wife and I have been searching for a new car. We hadn't originally been in a hurry to buy a new car, but an opportunity presented itself where we could sell our current car, a 9 year old Honda Civic, at a decent price to a family member. The family member had purchased a Toyota Camry 20 years ago, and it had finally quit on him and was going to be more to repair than it was worth. He decided to cut his losses, save the money and look for a quality car that would last him another 10-15 years. He thought our car fit the bill since he knew we treated our cars well, it still has relatively low mileage, and Honda is known for their reliability. Since he needed the car within a week or two, we had to start looking immediately. Thankfully because we pay ourselves a car payment even when we have paid off cars, we had the cash in the bank to be able to go and buy a new car on short notice – without having to get paid for our car first, get approved for a loan at a bank, or financing at the dealership. Paying Cash For Your Car: Not Normal? We know that not many people nowadays actually do what we do – paying cash for their cars. Paying for a car is one of the most expensive things most people will buy, right behind buying a house. If you don't plan ahead far in advance, you won't be able to do it, and financing a car will be in your future. Who can pay $10,00-25,000 for a vehicle without planning ahead? Not many people make enough money to do that. Saving up and paying cash for your cars, while it may not be normal – is a good idea. After you've done it a few times you'll have enough cash saved in order to buy a nice 2-3 year old used car every 5-10 years, while never paying thousands in interest again. Car Payments – A Fact Of Life? Recent statistics show that one-third of car buyers sign up for a six-year loan at an average interest rate of 9.6%. Among these buyers, the average price of the car is just over $26,000. This means that one-third of the cars you see on the road are dragging a $475 payment behind them. So 1/3 of car buyers have an average of a $475 car payment over six years at 9.6%. That means they'll end up paying nearly $33,000 for a car that retails for about $26,000. On top of that, the car will only be worth on average about $6,000. That's quite the loss! So why not make car buying more affordable, while at the same time freeing up more money for saving and investing? Buy A Cheap Car. Work Your Way Up. So how do you get started paying cash for a car? For me it meant that my first car was a bit of a beater. My first car was a 1986 Chevrolet Caprice Classic station wagon with 140,000 miles on it. I saved up the money from a high school job and paid $1500 in cash for it. It had cigarette burns in the upholstery, and was a gas guzzler, but it was paid for in cash. That car lasted me a few years during which time I still saved up money for my next car (which would hopefully be a bit nicer). When the old Caprice died, I ended up buying a slightly more expensive $6000 1996 Dodge Intrepid with 70,000 miles on it. That car lasted me another 5 years. When it started having engine problems I traded the vehicle in for a couple thousand, and used that money and the payments i had continued saving in the meantime to buy my next car, a 2001 Chevrolet Lumina. I paid $7000 in cash. That car lasted 7 years, at which time we paid cash for my current 2006 Chevrolet Impala. We got the money from my old trade, plus the payments we had saved to buy it for $10,995. So as you can see I've been saving up and paying cash for cars for the last 15 years or so, and never have I paid interest on any of those cars. Each time we buy a car we purchase one that is a bit newer, and in a bit better shape. That means the car lasts us longer and we're able to save up more for the next car. My current car has been with me for only 3 years, and I'll probably keep it for at least another 5-6 years at least. I've got a number in mind of how much I'll want to spend then. So in the meantime I'll continue paying myself a car payment until i reach that number. At that time I'll take that money and start investing it for our future! My wife has followed a similar process, starting out with an older used Honda over a decade ago, and working her way up to our current 2009 Honda CRV which we purchased last week. Buy a beater: Save up and pay cash for an affordable and reliable “beater” that should get you by for a couple of years at least. Don't forget to save up an emergency fund to cover any auto repairs that may come up. Pay yourself a payment: Pay yourself a car payment instead of the bank now that you have a paid off car. Use that money to pay cash for your next car. This car could be a bit nicer and more reliable since you'll be able to sell your old beater for at least some return, plus you'll have they money you've saved. Wash, rinse, repeat: Save up and pay cash every time you buy a new car. Every time you do buy a car you'll most likely be able to buy a nicer car as you've had longer to save, and more money to spend. The newer and more reliable the car, the longer you can own it – and the more you can save for your next car. Invest the difference: Take the money you've saved on interest payments and invest it! Of course this scenario is going to be different if you're one of those people that prefers to have a new car every few years. for a slightly different take on the subject, and how you can upgrade your vehicle twice in 20 months – check out Dave Ramsey's post on the topic. 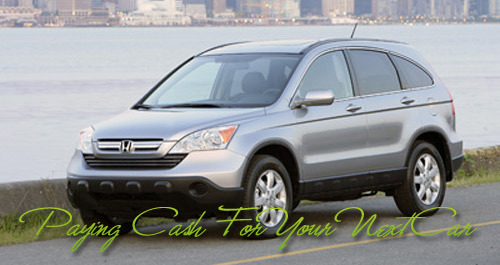 Have you ever paid cash for a car, or are you considering doing it now? If not, what has kept you from doing it? Frankly, I don’t know what I am going to do. My cars are getting old (16 & 14 years old). They could last for another 10 years, but I do not want to own them that long. I will probably start shopping for cars over the next 1-2 years. My wife’s car is almost paid for, and I was looking forward to not having a car payment, but I like the idea of keeping the car payment in order to save for the next car purchase. I traded in my car for a bike around 5 years ago. I used the extra money to pay for travelling and now for debt reduction. Life happens. Currently I spend around $400 a month on paying down my debt. Next year when that is done, I will have that extra payment to pad my emergency fund and save for more short-term needs (a laptop perhaps!) . Thanks for a post that encourages us to think forward instead of “now”. Next Post: Roth IRA: Emergency Fund?